Childbirth can be a touchy subject for many. Memories of past experiences or the emotions of happiness, trauma, sadness, or empowerment can accompany thoughts of how our children were born. For some, sharing their story is a way to inspire an expecting mother or family, while another would rather not acknowledge the past experience. So many go forgotten or untold. On average a 108,000 babies born to military families according to the DoD Birth and Infant Registry from 2003-2014. This is a relatively large number compared to the current 1,429,995 members serving on Active Duty. Almost 50,000 of those births take place in 50 military hospitals around the world. Several of these families will either experience the birth of their child alone, with a deployed or wounded spouse, or as a single active duty mom with no support. Many will have had just uprooted their life leaving one duty station for another. They are navigating a new location, which can often prove to be a stressful ordeal. Even more stressful can be changing medical providers and being sent out in town if a military treatment facility does not exist. Perhaps orders take a family to a foreign country. Where occasionally an expecting mom will use the local civilian care providers. Some will travel hours away to stay at the nearest military base until after the baby is born. Then comes the postpartum period where the service member is often headed back at work after only 14 days of Paternity Leave. Leaving an often tired and exhausted new mother home alone, still trying to mentally and physically recover from childbirth. It is the military way of life and many pick up and just push forward. Taking those experiences, tucking them in a box, way in the back of our minds. Are we being taught to just survive during this phase of our life? To accept the fact we will sometimes be alone during pregnancy and the postpartum period? What if there was an answer to some of these problems? What if it came in the form of a trained support person who steps in and provides the one-on-one non-medical care during pregnancy, labor and after the baby comes home? Could this kind of support help alleviate some of the stresses new families endure? What if this kind of support helped with mission readiness? We may have the answer: a doula for military families. The word “doula” is a Greek word that originally meant woman caregiver, a person in the Greek household who was given the job of caring for the lady of the house during birth. Today the word has come to mean a woman who is a professionally trained support person for the mother and her partner. She is knowledgeable about pregnancy, labor and birth, postpartum, the newborn, and infant feeding. Doulas are not medical personnel who rely on excessive technology, they rely on traditional, time tested methods. They provide emotional, physical ,and informational support for the mother and her partner, which can result in significant costs savings, improved mother and baby outcomes, decreased postpartum mood disorders, and significant improvement in both the immediate and long-term dynamics to a military family. Supportive care during labor does not include clinical care, but involves women who offer physical comfort, emotional support, and information. Doulas also assist women in communicating their wishes to caregivers, and engage their husbands or partners as desired by the couple. For an expecting woman without any support of any kind, having a doula can greatly improve her outcome and view on birth. When a family arrives home, a new mother needs to have someone looking after her in those first few weeks after delivery. A postpartum doula provides evidenced based information on things such as infant feeding, emotional and physical recovery from birth, mother–baby bonding, infant soothing, and basic newborn care. A postpartum doula is there to help a new family in those first days and weeks after bringing home a new baby. Having a baby is one of the most incredible experiences in one’s life. From the woman’s point of view, birth is a rite of passage, an event in which both safety and satisfaction have great significance. If having a healthy baby and healthy mother were enough, we would not have the high incidence of postpartum depression and mood disorders following a birth experience with a “healthy mom and baby.” Doulas focus on the emotional, physical, and informational support. They do not provide medical care as that is the role of the medical staff. In our mobile society, military mothers frequently do not have close relatives who are able to attend the birth or assist new parents immediately following the birth. Doulas provide the next tier of care to expectant and new mothers, and the positive results are backed by numerous studies. Many mothers, especially those with cesareans, reported that pain interfered with their routine activities and physical problems interfered with the ability to care for their infants. At 6 months, many women continued to experience stress (43%), sleep loss (34%), physical exhaustion (25%), and lack of physical desire (26%). Validated mental health screening tools found that at the time of the survey 63% of mothers were likely to be experiencing some degree of depressive symptoms and 18% were experiencing some symptoms of post-traumatic stress related to their childbirth experience. The women interviewed in this study were not in the military. It does however highlight some the needs for expecting women across America. Military members and their partners have special circumstances to contend with when having a baby. If a doula could be provided for these families at minimal or no charge to them, we could not only improve the birth outcomes and decrease the stress on the birth mother or partner (the active duty member), but we could significantly decrease costs for the military. Overall, aiding to mission readiness. Family readiness. Raising awareness and educating everyone in the military community about doulas and their positive contributions is just one part of the process. Many do not understand the need nor recognize the benefits of this type of support. Commands, leadership, existing family programs, and military treatment facilities can benefit from having trained non-medical professionals as a compliment to the military healthcare system. 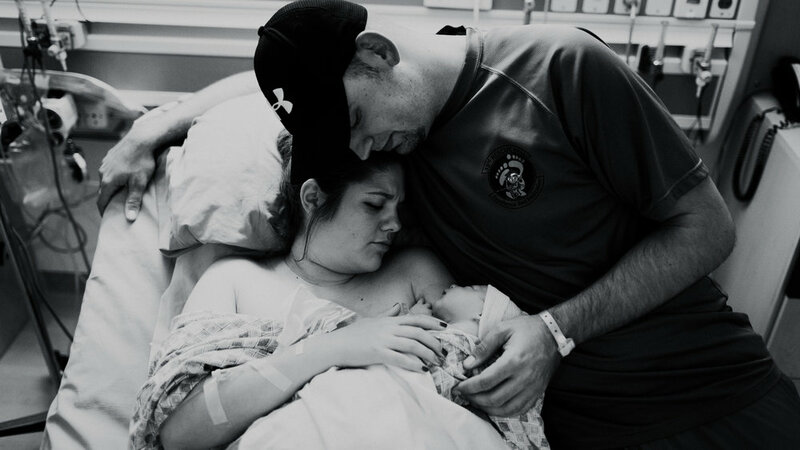 Utilizing doulas to fill in the gaps and provide continual support for military families during the one of the most overlooked times in their life.